I was taught that habitat is an important factor in conservation–and the results of stripping down a rain forest or bulldozing land inflicts damage that impacts not only the species that dwell in those areas–but also the world. 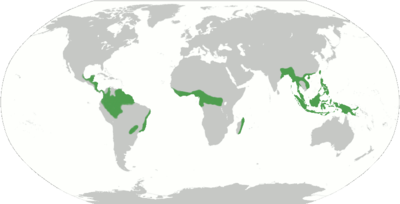 Photo: Global map of tropical forests. Locally we have developers that are removing trees so that they can build homes in the mountains. Now many people are really into the development which boggles my mind since the economy is tourist based–and the tourist come for the wilderness and environment. Many of us might not be so disgusted with the enormous homes except for they tend to be those massive structures that nobody lives in and that are only used for a week or two each year–if that. I left the area for a while and when I returned was shocked to find pristine eagle habitat had been traded to a developer and it now sports these large structures–the eagle counts are down too–go figure. Anyway, people are finally realizing that It really is time to pay attention and take action. An international team of scientists have discovered that rainforest trees are getting bigger. They are storing more carbon from the atmosphere in their trunks, which has significantly reduced the rate of climate change. The findings indicate that remaining tropical forests remove a massive 4.8 billion tonnes of CO2 emissions from the atmosphere each year. This includes a previously unknown carbon sink in Africa, mopping up 1.2 billion tonnes of CO2 each year. The 40 year study of African tropical forests–one third of the world’s total tropical forest–shows that for at least the last few decades each hectare of intact African forest has trapped an extra 0.6 tonnes of carbon per year. The scientists then analyzed the new African data together with South American and Asian findings to assess the total sink in tropical forests. Analysis of these 250,000 tree records reveals that, on average, remaining undisturbed forests are trapping carbon, showing that they are a globally significant carbon sink. The Intergovernmental Panel on Climate Change reports that globally human activity emits 32 billion tonnes of CO2 each year, but only 15 billion tonnes actually stays in the atmosphere adding to climate change. The new research shows exactly where some of the ‘missing’ 17 billion tonnes per year is going. “It’s well known that about half of the ‘missing’ carbon is being dissolved in to the oceans, and that the other half is going somewhere on land in vegetation and soils, but we were not sure precisely where. According to our study about half the total carbon ‘land sink’ is in tropical forest trees,” explains Dr Lewis. The study is released at a time when protecting tropical forests is gaining widespread support, and is likely to be a key theme of the upcoming negotiations to limit carbon emissions in Copenhagen later this year. “Predominantly rich polluting countries should be transferring substantial resources to countries with tropical forests to reduce deforestation rates and promote alternative development pathways,” says Dr Lewis. There are also broader implications for rainforest biodiversity, as the ecology of tropical forests changes. Further study is needed on how the interactions of the millions of species that live in the tropics are being affected by the increasing size of rainforest trees. To calculate the change in carbon storage in forests over time, scientists took 79 areas of intact forest across ten African countries, from Liberia to Tanzania, and identified, mapped and measured the diameter of all the trees above a threshold size. They periodically returned to re-measure the surviving trees, note tree deaths and record new trees, measuring over 70,000 in total. Combined with the height of each tree and the density of the wood (according to species) scientists calculated how the amount of carbon stored in each of the 79 areas changed over time. By extrapolating the data from the areas studied to all similar African tropical forests, they discovered a previously unknown carbon sink that is removing 1.2 billion tonnes of carbon dioxide from the atmosphere every year. The pan-tropical analysis utilizes 156 areas of intact forest from 20 countries (250,000 trees monitored). It shows, on average, that over at least the last few decades, trees in each hectare of tropical forest have trapped an extra 0.5 tonnes of carbon every year. To calculate the amount of carbon forests are absorbing, rather than the amount of CO2 they are removing from the atmosphere, the CO2 figures should be divided by 3.67 (to adjust for the mass of the attached oxygen atoms). African Tropical Forests and Afritron: Africa is the world’s largest tropical continent. It contains approximately 30% of the world’s tropical forests, including the Congo Basin, the world’s second largest contiguous expanse of tropical forest, after the Amazon. Dense wet tropical forest covers 3.8 million Km2, with a further 2.6 million Km2 of drier tropical forest. The forest is in two major regions: the West African forest area which stretches from Guinea in the far West to Togo in the East, with most forest being in Liberia, Cote D’Ivoire and Ghana. The central Africa block is predominantly spread across six countries, the Democratic Republic of Congo, Cameroon, Gabon, Congo-Brazzaville and the Central African Republic. African forests are home to tens of millions of people, including several hundred thousand indigenous hunter-gather peoples in the Congo Basin. African forests have the highest mammal diversity of any ecosystem, with over 400 species, alongside over 10,000 species of plants and over 1,000 species of birds. According to the FAO deforestation rates are approximately 6 million hectares per year (almost 1% of total forest area per year), although other studies show the rate to be half that (approximately 0.5% of total forest area per year). The African Tropical Rainforest Observation Network, Afritron brings together researchers active in African countries with tropical forest to standardise and pool data to better understand how African tropical forests are changing in a globally changing environment. Tropical forest and Climate Change: Tropical forests cover 17.8 million km2 worldwide, including 4.2 million km2 of drier tropical forest. Approximately 50% of the world’s tropical forests are in South America, 30% in Africa and the rest elsewhere, mostly in SE Asia. The first evidence that intact tropical forests are a carbon sink was published in 1998 showing that trees in Amazonian forests were a sink. The IPCC shows that land-use change, which is mostly tropical deforestation, emits 5.9 billion tonnes CO2 per year (20% of all human CO2 emissions). The research was funded by the Royal Society and the Natural Environment Research Council and by the many institutions and donors who funded establishment and monitoring of the study plots. Dr Simon Lewis is a Royal Society Research Fellow at the Earth & Biosphere Institute, School of Geography, at the University of Leeds.